JJC GB-1 Utility Photography Belt is designed to simultaneously accept 5 optional JJC DLP series lens pouches. 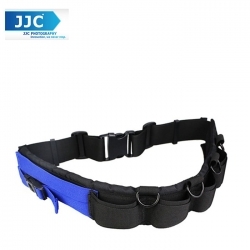 Lightweight and durable, the belt is made of 600 denier polyester, 3D breathable mesh, and durable POM. The belt is equipped with 4 metal D-rings which allow you to hang some photography accessories. Two elastic bands with a swivel buckle provide two ways to fix your camera lens during transport. The utility belt features a lockable buckle which can effectively prevent belt from loosening yet easy to adjust the length of the belt. The length of the belt is adjustable from 24"(63cm) to 46"(116cm).